Now that’s what I call bling ! It was with that sense of Santa Claus coming down the chimney bearing gifts aplenty that I just about managed to stay awake for the opening kickoff of the 2009 NFL season. Bearing in mind that it was getting past 1.30am here in England when the Tennessee Titans Rob Bironas made the opening boot I like to think I did my bit for the international support of the NFL. ‘I spoke to Coach Fisher and he said he has not come to Pittsburgh to kiss the Steelers rings’. Call me depraved but the image that phrase conjured up in my mind was only appropriate at around 2.30am in the morning after having eaten a box of Ritz crackers. Wait a second I did have that thought around 2.30am this morning, and yes I has just eaten the majority of the contents of a box of Ritz crackers. To cap the game off Willie was pretty limp, with a pathetic 19 yards on 13 carries. Above all was the first game of the 2009 NFL season worth the months of non-football agony – Hell yeah. The Titans defensive line looks like it can still do the business getting pressure on opponents qb’s after the loss of Albert Haynesworth to the Redskins. 4 sacks by the defensive line was very respectable. Thank goodness we have NFL football back. Here in England we have no live MNF, but as for the weekend we have three live games to look forward to. I can’t wait. What on earth will Trapasso do for an encore??? Forget that OAP in purple, move over Chad ‘whatever your surname is this week’, take a walk to the sidelines golden-boy Brady, the 2009 NFL Pre Season is all about one man. Yes he is a rookie, but I’m not talking about Donald Brown, Shady McCoy, Mark ‘pretty boy’ Sanchez, or even the cord-fed farm boy Matthew Stafford. The true superstar of this early preview of the 2009 NFL season is Tennessee Titans undrafted free agent punter Albert Joseph Trapasso known to the world as A.J. Trapasso. Not content with making headlines in Week 1 of the pre-season for scoring the FIRST touchdown of the year in the Hall of Fame game (on a perfectly executed fake punt run), Trapasso decided to make the highlight reel AGAIN in week 2. To outdo himself the former Ohio State Buckeye decided to mess up the scoreboard at the new but traditionally named Cowboys Stadium. His skyrocket punt had to be done 0ver after he lofted the pigskin into the base of the giant scoreboard, falling to earth with snow, and fragments of moonrock dust. See below. Trapasso was signed as a rookie free agent by the Titans on April 30 2009, after booting the ball for four years for the Buckeyes. With vet punter Craig Hentrich injured and Tennessee cutting Josh Miller earlier in the week Mr Trapasso could become the Cinderella figure of the 2009 NFL season. On closer inspection Trapasso’s run in Week 1 (preseason) was no coincidence – the Columbus Ohio native was an outstanding high school running back at Pickerington (Ohio) High School. 3,754 yards and 50 touchdowns in High School is a set of stats to be very proud of. Trapasso was also a two time all state High School selection. I doubt Ill write a post about a punter for another year, but with the A.J. Trapasso book still being written I cannot wait to see what is on the next page…..
Go A.J – you are my new rookie punting hero ! I spent the last week on holiday in Cyprus, floating in a swimming pool listening to a whole raft of NFL pod-casts, some good, some poor and some that ITunes should have simply blocked from being uploaded. In that time I did not access the Internet, and the only English speaking tv channels in the hotel were Sky News and BBC News. Neither found the death of Steve McNair to be worthy of any sort of coverage, so when I switched my laptop on last night to discover McNair had been shot in the head and body I was taken aback. McNair was the dictionary definition of a warhorse, a player who had guts, guile, great feet and above all the ability to lead a team. One co-NFL MVP award, three Pro Bowl appearances, one All-Pro nod, an AFC Championship ring and a start in Superbowl XXXIV does not really go anywhere near justifying Steve McNair the NFL quarterback. He earned every one of his 31, 304 regular season passing yards and deserved credit for every blade of grass and yard of AstroTurf he ran over to gain 3,590 regular season rushing yards (an incredible 5.4 yards a carry career average). McNair was a warrior who finished 20th All Time in the NFL for pass completions and 12th All Time for career low interception percentage. Having been drafted 3rd overall by the Houston Oilers in 1995, only Kerry Collins has surpassed him in passing yards for the Class of ’95, he did however out rush TWO 1995 first round running backs in his career (Ki-Jana Carter selected number 1 overall and Rashaan Salaam selected 21 overall) – this from a QUARTERBACK. The gruesome nature of McNair’s death is something that I nor any Oilers, Titans or Ravens fan will want to dwell on for long I am sure. Instead it is best to remember Steve as #9 a warrior, a gladiator who stood toe to toe with foes for 11 NFL seasons, never backing down a challenge, always ready to scramble that extra yard for a first down and always willing to inspire his team mates to move down the field for a score. Time famously ran out for McNair in Superbowl XXXIV when his pass to Kevin Dyson failed to reach the endzone, now time has permanently run out for Steve McNair. I’m sure the big man upstairs has room for a quarterback like Steve McNair on his roster. R.I.P Steve McNair – a true NFL warhorse. What does the Queen and Dan Snyder have in common? Hmm so this is how Dan gets his money back !!!!! That’s the Queen that sits on the throne at Buckingham Palace and not the deceased rock star who continues to rock NFL stadiums during time outs. Well the answer is ………both have two birthdays. Every year it seems Mr Snyder manages to have his own little private party with NFL studs when the free agency period commences. 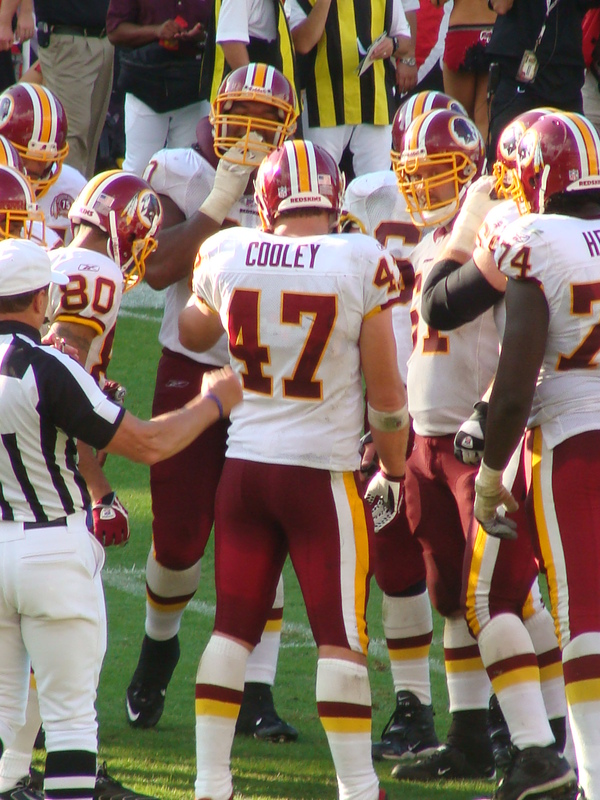 2009 has been no exception, as the Washington Redskins signed THE best FA available in the form of Defensive Tackle Albert Haynesworth, and in the same day re-signed Cornerback DeAngelo Hall. Within about 24 hours the Redskins have sent an email to all their fans to pre-order Haynesworth shirts (see above). To recoup the $100 million that it has cost to get Haynesworth from Tennessee thats gonna mean the sale of a military aircraft hanger full of shirts. The Redskins needed to upgrade their defensive line, and Haynesworth is a stunning way to start. Now they need some defensive ends to go with Big Al. Washington’s pass rush has not dominated since Charles Mann and Dexter Manley were together almost 20 years ago. Judging from Al’s opening Redskins press conference he was very impressed by the Redskins history, and he felt very happy with the three Vince Lombard trophies standing in front of him as he spoke to reporters. Lets just remember one thing – the Redskins have not been to a Superbowl for a long time. Can Big Al make the difference? Not by himself, but he will certainly give a big boost to the team both via ticket sales and by locker room leadership. Will he get a Pro Bowl berth in 2009 – No – He now has the cash and will be gameplanned around but he will make the Redskins D line stronger and if he can get 5 sacks it will make a huge difference. It is just me or is there NO point voting for Pro Bowl players in Week 7? The oft debated Pro Bowl - voting is open - ALREADY ! 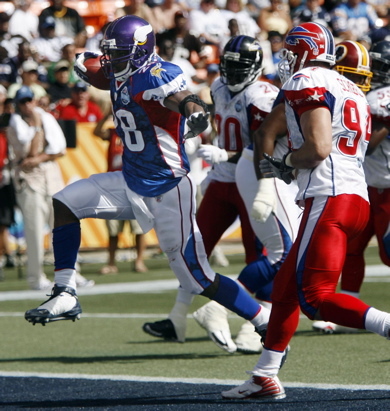 With 11 weeks of the 2008 NFL Regular Season still to play for the NFL powers that be have decided that it is time for fans to start voting in the annual popularity contest, oopps, I mean Pro Bowl. Maybe it’s just me but I think voting for people to be playing in Honolulu on February 8 2009 in late October 2008 is a bit premature. Lets face it over half the players will be voted in on reputation alone, especially positions that garnish little fantasy football interest such as offensive and defensive linemen. People going to vote are going to click on the likes of Jeff Saturday and Olin Kreutz because they recognise their names from previous Pro Bowls. Who knows the Arizona Cardinals could have the best C in the NFL, but unless you live in the desert it is unlikey you can name him. Just for fun the Cardinals starting C is viewable on THIS LINK – did you honestly know who it was? Thought not. Another reason I am cynical about opening the voting in Week 7 is that there is a helluva lot of football still to be played, and this means heroes (of week 1 through 6) becoming zeros and vice versa. A few examples spring to mind following this rash of starting quarterbacks being hit by the injury bug. Lets first look at the Bengals. QB Carson Palmer is likely done for the year, and Ryan Fitzpatrick is now stepping in. Despite a 0-6 start the theory goes that Fitzpatrick could go 10-6 and lead Cincy to a playoff berth. This would go un-noticed on the Pro Bowl radar as the likes of Peyton Manning will be a shoe in, with people likely voting for him already, despite a start that has been far from perfection. Likewise the undefeated Tennessee Titans could throw up a horror show and end up 5-11, but the likes of DT Albert Haynesworth or even dare I say it Kerry Collins could be getting fitted for a hula skirt. Before NFL fans are able to vote they should apply to the NFL via an online form. In that form they state the NFL team they support. Then when the online form is opened you CANNOT vote for players on the team you support. What do you think? Please vote below and also give an opinion…….